Tag Archives: Take a picture and then send it (to me to prove it). 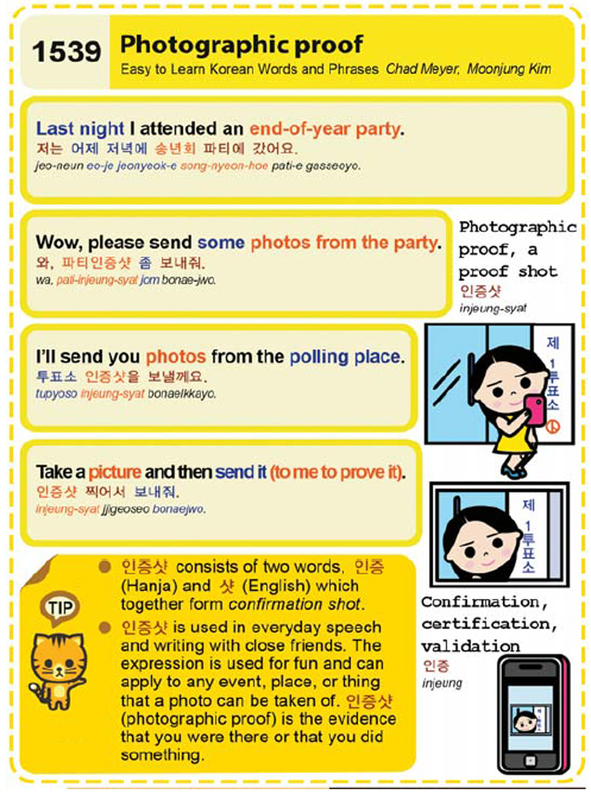 Easy to Learn Korean 1539 – Photographic proof. Posted in Series	| Tagged evidence, injeungsyat, I’ll send you photos from the polling place., Last night I attended an end-of-year party., photo, photographic proof, please send some photos from the party., proof, Take a picture and then send it (to me to prove it)., Wow, 샷, 와, 인증, 인증샷, 인증샷 찍어서 보내줘., 저는 어제 저녁에 송년회 파티에 갔어요., 투표소 인증샷을 보낼께요., 파티인증샷 좀 보내줘.